As promised I am sharing something beautiful today. This is my favorite place in the world. In fact if my children outlive me (and do what they are told) my ashes will one day be scattered right here. 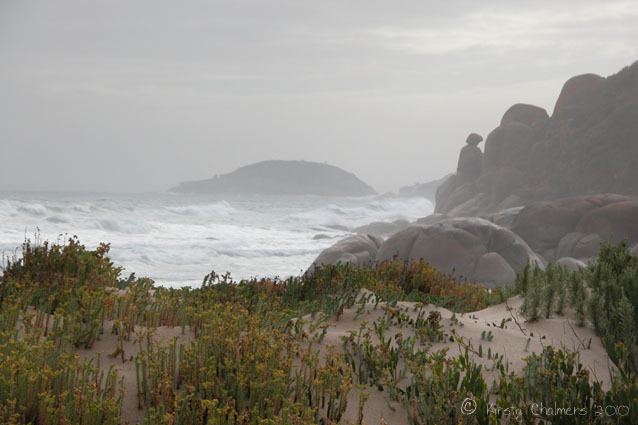 Wilson’s Promontory National Park includes the southernmost point of the Australian mainland. It is wild, vibrantly alive and extraordinarily beautiful. I have heard so many comments lately attributing the problems of the world to the greedy multi-nationals. ‘They’ seem so willing to destroy the environment rather than give up the mighty dollar. ‘They’ want prosperity. This got me thinking. I want prosperity too, we all do. Only to me prosperity is about clean air, clean water, abundant fresh food, free time, a gentle pace to life, music, art, love. Although corporations seem to rule, they are run by people. So maybe what the world needs, what the corporate executives need, is an opportunity to redefine prosperity. Perhaps ‘they’ also deserve at least a little compassion. I wonder if the things that represent prosperity to me really mean so little to them. We are all human after all. What I’ve come to is that corporations only have one real obligation and that is profits for the shareholders. Now, I don’t think the CEOs are necessarily bad people or the shareholders. I think they are too far removed from one another to be able to make decisions together that benefit everyone. The CEO doesn’t want to lose his/her job and the shareholders aren’t involved with daily decisions to know what their stocks are really costing them. Redefining prosperity is definitely needed. I think big change needs to happen in order for people to understand what it means to be rich. I think for too long people have been living in fear. Too many people look at this world and see things lack. Those who still have wonder and see horizons everywhere are people who see that the world is abundant. Thank you and thanks for visiting. It’s so true what you say about seeing the wonder in the world. We benefit so much from reclaiming the childlike innocence we were born with. What a sweet place and gorgeous photo of it. I need to have CEO retreats up at my place. They couldn’t be here for a week and not come away with a completely different attitude about what “prosperity” is. It is about being in balance within one’s self, one’s place in the world, and with nature. If one is balanced in all these areas, the rest of it is easy! That is a great idea. I have no doubt our common humanity and heart is more powerful than our apparent differences. Sweet photo and I agree with your sentiment. You know the old saw, ‘Think globally, act locally?’ I think that’s what you’re doing with your little piece of the Web. I notice here in the western US that the recession has changed some spending habits. Folks are having to decide what’s important. The next generation will now have to carry the baton and set priorities. And as a father of two college age kids, they seem much more in tune with progressive ideas than much of my generation. thanks FJ. It’s nice to think I might be doing my little bit here. This would be further evidence to me that the best we can do is find what we love and get stuck into it! I know what you mean about today’s young people. My daughters are 19 and 15, and they are far wiser than me. Kristy, you took the words right out of my laptop keys. Thank you. But I do really wonder about the people who run corporations. They are clearly operating on a much different value sysltem than you and I—with negative consequences for all of us. How do we change their thinkng? Good question WB. I do know that we humans are all complex creatures, none of us entirely ‘good’ or entirely ‘bad’. We are all connected, and I truly believe we must start by recognizing our common humanity. I don’t know. These folks seem to define ‘evil’ by example of their behavior. It seems like we have common humanity but do we really? Is that our delusion in dealing with such ‘people’ who don’t give a damn about other living tihngs? I don’t know. It’s a hard hard thing to figure out to get to them positively. I hear you. I haven’t given up though. Kirsty, a beautiful photo of a lovely location. My word – that place is just SO beautiful Kirsty! It’s like something out of a fairytale! We forget sometimes how much beauty is still to be had in this world – thanks for sharing this amazing photo! Thanks Lynda – it is an amazing place, much loved by the locals and pretty much anyone that visits there. It is paradise for photographers as there is always something beautiful going on. Hmmm, I wonder. It would be interesting to know what they think of prosperity – and a few other things…. Oh Ruby, you must put it on a list of things to do, then do it! A great place to take kids with very civilized camping and stunning beaches. Hi Kirstyfliesfree. Glad you liked the photo. This one is very inviting. Would you be willing to NOT purchase any gasoline on July 27? ah, that’s the day? I have heard about this. i just left a comment on your post. If such an action is promoted I will certainly participate. As I said in the other comment, I would be interested in a no drive day so we are actually using less oil, rather than just rearranging the day on which we buy it. I don’t know if this is the date in Australia. It’s just a tiny tiny first step. I’m curious just how far we can spread it just here from blogland. Have to start somewhere, some time, some place. Why wait??? I agree completely with your broader view—but a start of awareness is a start for folks who might want to do more than sign a petition. Beautiful photo of a perfect place. I believe what you wrote is perhaps one of the most perceptive takes on this situation of abundance that I have read as of late. Then Kate’s take on it about balance adds the finish to it. Thank-you to both of you for your insight and perspective on a difficult subject. Thank you so much Leslie. Your comment means a lot to me. I also loved what Kate had to say.